Can You Use You Electric Chainsaw to Cut Down a Tree? However, if you think you can do the job and have an electric chainsaw in the house, why not try doing it on your own? Chainsaws are made to cut down wood and other materials through the use of a mechanized rotating blade that is attached to a bar. The high-powered rotation of the chain makes the chainsaw a powerful tool to cut wood fast and easy. 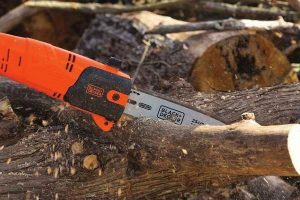 In this article, we will discuss whether you can cut down a whole tree using an electric chainsaw. Can A Chainsaw Cut Down a Tree? While the immediate answer that we think of is “yes”, this may not be the answer each and every time. Even though we picture a lumberjack cutting down a tree with a chainsaw, it is important to know that there are different types of chainsaws. There are two main types of chainsaws: electric-powered and gas-powered. Gasoline-powered chain saws are high-powered and use gasoline to run. This is why this type of chainsaw is often used in outdoor places that do not have any access to electricity. Electric chainsaws, on the other hand, run with the use of electricity. 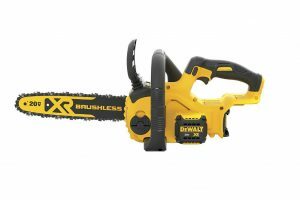 Electric chainsaws can be cordless or have a long cord attached. 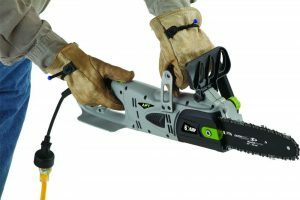 Cordless electric saws run on batteries which can be recharged or swapped. The battery can add weight to the electric chainsaw but offers better mobility. A corded saw has the advantage of no longer needing to recharge batteries or refuel for it to work continuously. However, a disadvantage of using this type of electric chainsaw is that your work is limited to where your cord can reach. This is why you should check your user manual on the recommended extension cord that you can use with your electric chainsaw which will not affect the power source. 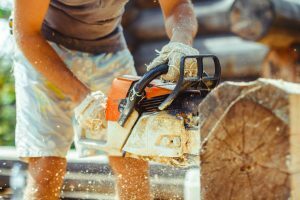 Upon identifying the type of chainsaw that you have, you should know whether your electric chainsaw is made for a light, moderate, or heavy use. 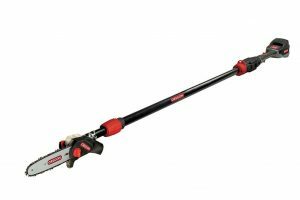 Small chainsaws that have a cutting bar that is 6 to 14 inches long are made for light cutting of small trees and shrubs. 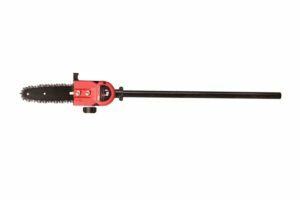 Moderate use electric chainsaws have a cutting bar that is 16 to 18 inch long and can be used for cutting trees, branches, and logs. A heavy-duty chainsaw is made for larger jobs that require a stronger and more powerful cutting force. They often have a 20-inch cutting bar and are used for cutting down wide and thick trees. 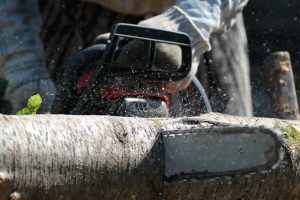 If you have a medium to a thick tree that needs to be cut in your backyard, you should use a heavy duty or moderate-use chainsaw to do the job. 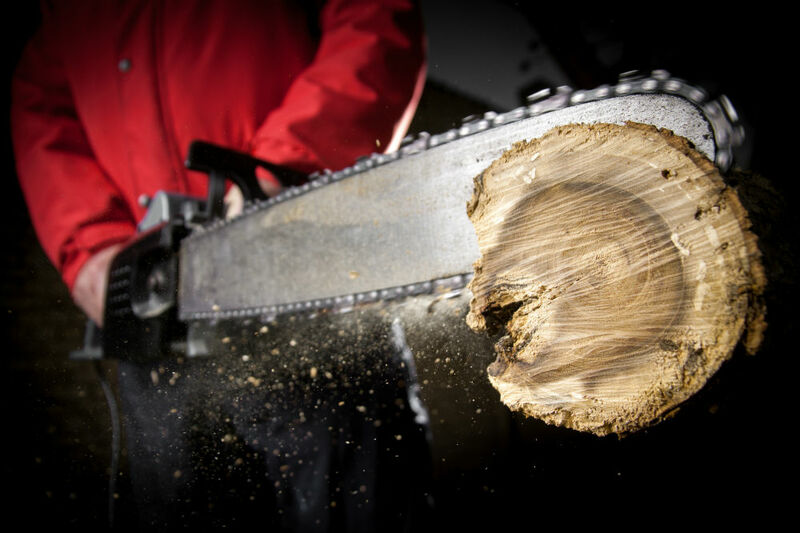 A light-use chainsaw can get damaged when cutting thick tree trunks since it has a small blasé and cutting bar. While the majority of people who cut down thick trees prefer using gas-powered chainsaws, you can use your electric chainsaw as long as the user manual says you can. Follow the proper tree-cutting techniques and guide to prevent cutting down the tree in the wrong direction, harming yourself, as well as damaging your electric chainsaw. What should you do Before Cutting down a Tree? Before proceeding with your project there are some things that you have to prepare for first. For example, you should check with your local government about laws and policies with regards to cutting down a tree. Due to the environment awareness and protection campaigns, local governments have adopted local laws where it is illegal to cut down a tree without a permit. Even if you are a lumberjack or an expert in cutting down trees, it is still important that you wear the right protective gear and safety equipment to ensure that you will not harm yourself while doing the job. First of all, never go outside to cut down trees or anything at all, wearing clothes that can easily be cut or ripped. Preferably, wear cut-resistant pants, cut-resistant gloves, steel-toe shoes, hard hat, ear protection and eye protection. While you may think that wearing all of these is a bit overboard, you should know that cutting down a tree is a messy and accident-prone work. Sawdust, tree limbs and debris will be flying off in all directions and can get in your eyes and ears. As such, you should also advise your family members to stay away anywhere near the tree to be cut down. If you have an electric chainsaw with a cord, make sure that you have a long extension cord that reaches from the power outlet to the tree. The extension cord should not be pulled with your every movement to ensure that the power source will not be cut while you are working. You should also carefully examine the tree that you are going to cut down. How high it is and how far will it reach when it falls down should be greatly considered since this can fall and bring down other objects with it if it is too tall and you have a small space in your backyard. If your tree has a wide reach and has many roots and branches, try to remove these first to minimize the space that will be occupied when it falls down. Cutting your tree piece by piece, especially if it is near your house is better than tackling and cutting the tree in one go. Lastly, check your electric chainsaw if all the parts are working perfectly. The chain and bar should be well lubricated for it to work seamlessly. A chainsaw that is not well-lubricated can cause some unnecessary friction and overheat which can greatly damage your chainsaw. This can also make your tree-cutting end abruptly when your machine malfunctions in the middle of your work. 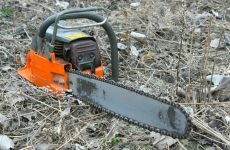 By following this simple guide in knowing your electric chainsaw, you can do the job of cutting down a tree in your own backyard with no problems! Click here to read user reviews on Amazon. When Should You Sharpen Your Chainsaw Chain? 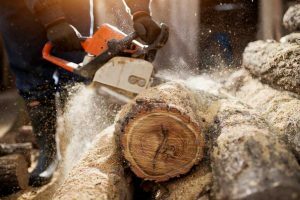 Chainsaw Manufacturers: Which One Is the Best Chainsaw For You? Some recommended products may use affiliate links. ElectriChainSaw.com is a participant in the Amazon Services LLC Associates Program, an affiliate advertising program designed to provide a means for sites to earn advertising fees by advertising and linking to Amazon.com. Amazon and the Amazon logo are trademarks of Amazon.com, Inc or its affiliates. Copyright © 2019 Electric Chainsaw. All Rights Reserved.